This month in Wisdom from the Downstream Wizard we thought it might be a good idea to dust off the Bubble Map and take a look at the differentials around the country. Back in January when we declared the Mid Continent crude oil arbitrage closed, WTI was $29 a barrel. While prices have gone up since then, with WTI at $51 per barrel on October 11th, differentials remain relatively stable. The Brent price has risen to $2 over WTI. The Western Canadian Select discount has narrowed slightly to $11 under WTI. On the Gulf Coast, crude oil from the shale formations in Texas like Eagle Ford were priced at parity with WTI, and Louisiana Light Sweet was at a little more than $1 over WTI. On the West Coast, the Alaska North Slope differential has dropped to $2 under WTI. The San Joaquin Valley Heavy discount widened to $6 under WTI on October 11th. Bloomberg is reporting that Mexico’s Pemex has announced its intention to export Mexican Maya to the West Coast with the price set for November sales at $3.70 per barrel below marker crudes. 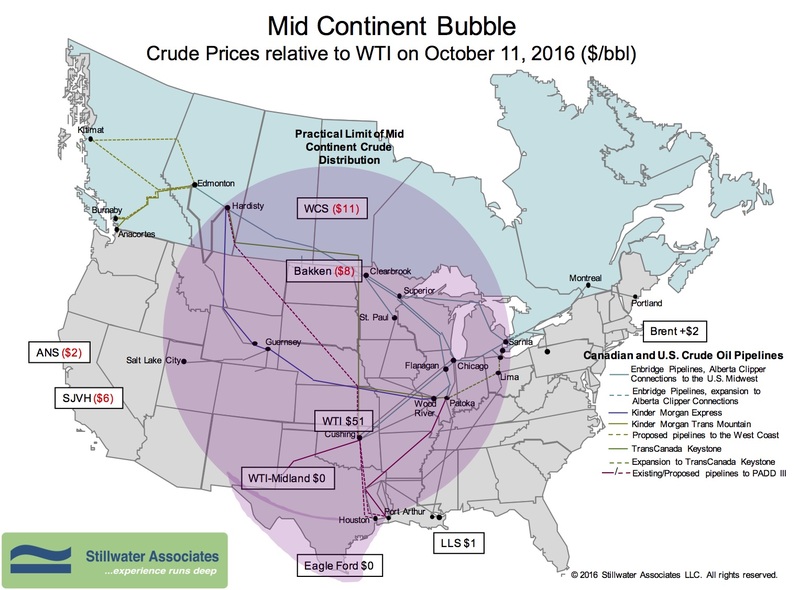 Pipeline capacity out of the Mid Continent Bubble has increased dramatically this year, as rail movements have decreased by the same factor. While rail movements primarily brought Mid Continent crude to refineries on the East and West Coasts, the current pipeline movements deliver crude oil to refineries in the Midwest and Gulf Coast. Although crude-by-rail deliveries to the Pacific Northwest are still quite high, the Mid Continent pipeline capacity has created an opportunity for imported volumes to the East Coast and California refineries. According to the EIA, imports in the first half of 2016 rose by 7% compared to the first half of 2015. Importers to the East Coast and California are taking advantage of a few factors including a decrease in shipping rates to all time lows and increased refinery utilization. As a result, East Coast refiners are benefiting from competitively priced Nigerian crudes. California has seen an increase in imports from Canada, Saudi Arabia, and Ecuador. It seems that Pemex also sees the advantage of satisfying increased demand from California refiners. We’ll keep an eye on the players as the crude oil glut continues to shake up the markets.